Are you looking for guaranteed secure support for walls, floors, ceilings, or temporary beams to allow you to get on with the job in complete safety? There is only one answer: Acrow props. 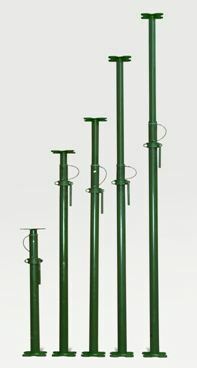 These strong, lightweight, simple to install, adjustable steel props are specially designed for the job and meet all safety standards. It’s because they are so easy to handle and so totally reliable that they have become a household name and are in use on building projects everywhere. The days are long gone when builders spent hours making their own wooden scaffolding, sawing each piece to fit. Nowadays, the job is quick and easy. Steel Acrows provide sure, strong, safe support you can always depend on. There’s no need to take risks when supporting walls and ceilings. Let Acrows take the strain. Get peace of mind and get on with the job in complete safety by hiring Acrow props. They come in a range of sizes, fully adjustable, and perfect for a wide range of jobs. These days the steel tubes are even lighter, although as strong as ever, and they can all be used with extra attachments such as Strongboys. Acrow prop hire is simple. It’s just a phone call away. Lakeside has all the props, we guarantee next-day delivery nationwide, and we’ll gladly provide all the information and advice you need. You can hire Acrows online via our website, or give us a call on 0845 619 5811 and speak to one of our hire desk team. Call Lakeside-hire today.